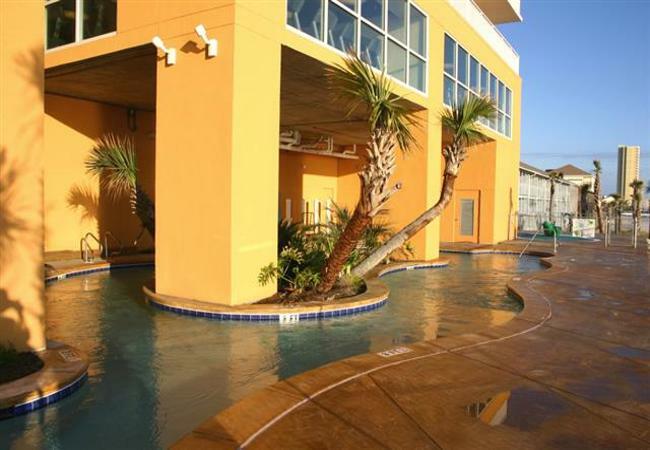 Splash Resort Condos on Panama City Beach is a luxury gulf-front condominium perfect for families. It isn’t just a beachfront condominium, it’s a waterpark! Splash has 2 towers with 21 floors of fun, decked out in bright colors, whirling designs and all the splashiness you can handle. The fun starts at the sky-walk entrance and continues with family-friendly features like the beachfront arcade. Two unique, bi-level pools stretch across the entire ground level, looping, swirling splashing underneath you. A second beach-view pool occupies one side while the other is a kid-ready water themepark complete with waterpark-like slides, waterfalls and bucketloads of even more water as well as a jacuzzi. Splash Resort Panama City Beach is located on 400 feet of pristine powder-soft sands, in the heart of the action on Panama City Beach. Your kids will have to see it to believe it but Splash is not just for kids! Mom and Dad will love the Splash vacation rentals too, and not just because the kids are having a blast. There is an adults-only swimming pool and Jacuzzi with a bird’s eye view of the kids play area, a state-of-the-art fitness facility overlooking the pool and lazy river, a poolside bar & grill, high-speed internet access and an on-site beach apparel and surf shop. Not to mention a fantastic Front Beach Road location with easy access to Pier Park shopping, movies and restaurants (approx. 2 miles away) and quick access to the shops and restaurants of Hwy. 30-A’s Rosemary and Seacrest Beaches (approx. 7 miles away). Outside your door you’ll find our crystal-clear emerald Gulf waters and soft snow-white sandy beaches. Stretch out in the sun or take a dip in the Gulf. Here you can relax while the kids dive into big fun! Splash is the perfect family vacation place. Make it yours.